My stepmom (aka Grandma Leslie) introduced Julian to the kitchen counter at her house, way before it would have occurred to me. And she also invented potching. Bring a stool to your empty kitchen sink and let your toddler climb up. Fill the sink with warm soapy water, plastic cups, utensils, etc. 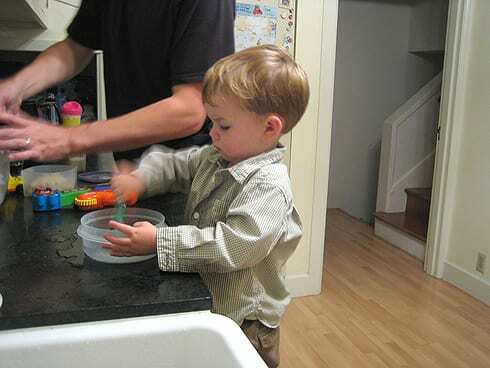 Let your toddler pretend to make something or wash dishes. For some reason my little man likes to say he’s washing dishes. Far be it from me to inform him that washing dishes ain’t fun. I have been surprised at how long this can occupy a person who is between two and three feet tall. He would like to “wash dishes” next to anyone who is actually washing dishes. My unprofessional opinion is that if your child is walking, she is old enough to try this one. Ha ha! I wonder if this counts for being along the same lines… twice this past week, Holden has helped me make salad. I give him a bowl on the floor with some lettuce and tell him to rip it really really small (he’s great at this! ), then I give him small cut-up pieces of vegetables to add to his bowl. I don’t care whether he nibbles at them or not (so far, unlike me, he does not), and this little game also encourages me to add more different veggies to my salad. sol LOVES “bubble” aka doing the dishes. I call this “sink scientist” and yep, it rocks. I’ve had some success with giving my son bowls of dried beans and split peas and a little spoon and letting him move them from bowl to bowl, sometimes spooning and sometimes just dumping. I put the bowls on a tray which helps with the mess. Black beans are a big hit, yellow split peas good too, black lentils were too tiny and got EVERYWHERE. We also picked up a variety of in-the-shell nuts recently (Berk Bowl bulk bins) and he enjoys filling up his dump truck and running down the hall and dumping them out again. I wish they didn’t get everywhere, but it keeps him busy (and it was super cute when he was trying to fill up every open space on his fire engine with nuts – “help me, Mama!”). This is a great addition, Annika. I’ve never been brave enough to go for those bulk bin items for playing. Oh, I should also say he is a couple months past 2.5 now and doesn’t put the beans/peas in his mouth, ears, or nose! Not sure how young you could start this activity. I’ve got 3 boys and I have let all of them do this in their toddler years. They love the soap bubbles, they love to scrub and I’ll take a puddle of water in my kitchen over playdoh on my carpet anyday!